Need to move something? We have some unique tools here that are truly worth your while to check out. Not sure how to move a fridge across a wood floor without scratching the hardwood? We have an air sled that works like a hover craft – it can lift 500 lb! Our forklifts can lift up to 5000 lb, and some of our jacks can lift up to 45,000 lb. What we’re trying to say is: if you need to move something heavy, give us a shout! Our break-down engine crane has a lifting capacity of 700 lbs. These industrial-strength Jet hydraulic bottle jacks stand at 91/2” when closed, and 18-1/2” when fully extended. 12-1/2 ton capacity. A larger version of the above 12-1/2 ton, these jacks stand at 10-5/8” when closed, and 16-5/16” when fully extended. 22 ton capacity. This 5000 LB capacity hydraulic pallet jack features wide, 27” × 48” forks and a three-position handle for easy operation. 15 or 18 ton capacity. Our sturdy 15- and 18-ton screw jacks are ideal for supporting heavy loads. Complete with a serrated top to help prevent loads from slipping. Max. lifting capacity of 750 lbs. Airsled moving equipment provides a safe, efficient and effective way to position appliances in virtually any setting. The air bearing/air caster systems allow you to easily move and replace or reposition stoves, refrigerators, washing machines, dryers and more without damaging floors or pulling back muscles. Here’s a video of the Air Sled in use. This five-foot high dolly features solid rubber wheels, stair-runners, and a single ratchet strap. Hard surfaces only! Tall frame, dual ratchet-strap design. Standing at six feet high and featuring two ratchet straps, this dolly also has hard rubber wheels and stair-runners. Stop breaking your back moving trees and boulders! We have two heavy-duty dollies for rental – our purple dolly (“Wilma”) has a 1200 lb. capacity, while the larger orange dolly (“Fred”) can carry up to 1600 lbs. These dollies are ideal for tree balls, large planters, heavy boulders, statues, water drums, and much more. Wide tires offer maximum stability and ease of use through mud, gravel, and rough terrain. Well balanced for optimal leverage and roll, and it’s even “gate friendly”! The versatile “lattice-rib” construction supports both small and large containers, root balls, boulders & pavers with ease. Light duty use only; maximum 250 lbs. This lightweight dolly is a 32” × 18” platform supported by a quartet of solid plastic wheels mounted on swivel casters. Great for moving. This dolly can be narrowed down to 30” wide or expanded to 48” wide. Air filled tires provide traction over soft ground and are lockable throughout 360 degree rotation. 1200 lb load limit. Dolly is 16” tall and 56” long with a pivoting handle for pulling heavy loads. Rental price includes pair of jacks. This piano moving dolly consists of a pair of wheeled jacks: sliding one under each side of the piano lets you lift the entire unit effortlessly. Steel construction with rubber wheels. A larger version of the furniture dolly, this 54” × 27” steel platform has solid rubber wheels (two on casters) and a (re)movable handle. Great for moving large crates and barrels. A seven-foot wooden handle with a pair of wheels and a bevelled steel foot plate; this unit easily slips under crates, barrels, and other heavy materials. Have you ever wanted to move your garden waste in something bigger than your car trunk? Tired of borrowing an old junker to move heavy loads? Look at the specs and you’ll agree that these movers will do the job with ease. These trailers are 12’ long with 2’ high solid sides and 4’ easy entry/exit rear-mounted ramps. Choose either a 5’ wide or 6’ wide trailers to haul those heavy loads legally and efficiently. Perfect for your bulk landscape needs, or moving heavy equipment! Rent this trailer for HALF PRICE when you rent a Trencher or ANY other piece of equipment from us! Our truck ramps come as a pair, include safety cables, and have a 1000 lb capacity rating. Low, medium, hi, and Reverse Gear. This nifty little gas-powered wheelbarrow is a must for those hard to access, up-hill landscaping projects. With it’s 4-wheel drive grip wheels this unit will traverse slopes and muddy conditions well. The dump box holds approximately 1/4yd. of material heaped. Has forward and reverse gears. Note: This is THE tool to use if you are wheelin’ up a hill. This is a great machine to reduce your physical labour on any job site. The Kubota KC70 is a diesel powered electric start ride-on wheelbarrow with a big 1/2 yard capacity – 1550 lbs! It’s capable of fitting into confined or narrow spaces. The track and roller drive powers through mud and climbs steep inclines and difficult ground with ease. Cover more ground quickly with three forward gears. You’ll appreciate the value of the hydraulic dump, which makes the destination delivery easy – and fast! Note: Three forward gears for different speeds of travel! 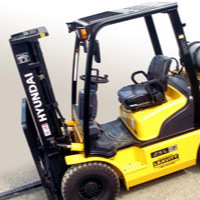 The Hyundai 6000 LB Forklift combines a number of features that continue to make it one of the most popular forklifts on the market. Fast, stable and powerful, they offer a potent combination of high fuel economy, low emissions and low noise levels. As well, the high-visibility mast and familiar pedal layout make for easy operation. Rental pricing for our forklifts assumes that you will be picking up the machine from the store. If you do not have a capable trailer we can either rent you one, or you can have us deliver and pick up the forklift, at your convenience. Note: Workers are not permitted to drive powered forklifts unless they are trained and have demonstrated competence to safely operate the assigned equipment. According to Worksafe BC regulations, your employer is responsible for all training required to operate a forklift before using it. A complete forklift operations manual for our forklift trucks is found in the seat back pocket. Please read it carefully before use. 1000 LB and 2000 LB hoists available. Our heavy-duty chain hoists are available with a capacity of 1000 or 2000 lbs, and include safety hooks. 1-1/2 ton or 3 ton capacity. Our Jet come-a-longs features a double-action ratchet, extra strong handle, and a quick-release lever for free-wheeling action. 1-1/2 ton or 3 ton capacity available. Our drywall lifts will lift up to 150 lbs of wall board to a maximum height of 11 feet. Simple, one-person operation. The model 2315 drywall lifts will lift up to a maximum height of 15 feet, and features a load capacity of 150 pounds. The break-apart design allows for easy transportation and setup. Uses compressed air to hoist up to 500 lbs. The Genie Lift uses compressed air to hoist a maximum of 500 lbs up to 18’3” high on its 38” × 48” wood platform. One-person operation. Rental includes a pair of jack stands. We carry 3- and 5-ton capacity jack stands, featuring multiple locking positions and stamped steel construction. Our galvanized post shores work as temporary supports for projects such as replacing deck posts. Their dual adjustment system allows for precise height calibration to suit the needs of your project. Four different sizes are available for rent. Please note: shoring posts are not jacks and are not designed for any lifting.